Cloud With Computer Mouse Globe PowerPoint Templates And PowerPoint Themes 1012-Develop competitive advantage with our above template which contains a diagram of grey computer mouse connected to word Cloud. Letter O is replaced by a globe. It portrays the concept of connection, information, internet, media, server, technology, transfer, upload and www. This template represents the concept of networking. It makes interaction and communication more convenient. Outline your targets to your team. Inform them of the various means they have to achieve them. Help them align their arrows to consistently be accurate.-Cloud With Computer Mouse Globe PowerPoint Templates And PowerPoint Themes 1012-This PowerPoint template can be used for presentations relating to-"Browse The Global Cloud, Earth, Globe, Cables, Business, Technology" Open the chamber with our Cloud With Computer Mouse Globe PowerPoint Templates And PowerPoint Themes 1012. Your thoughts will unravel all the secrets. 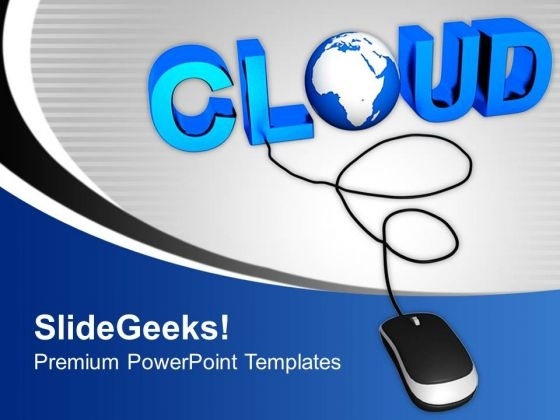 Equip your thoughts with our Cloud With Computer Mouse Globe PowerPoint Templates And PowerPoint Themes 1012. They will prove a worthwhile accessory. 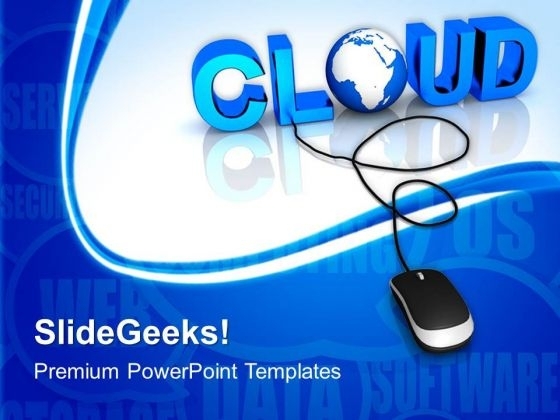 Cloud With Computer Mouse PowerPoint Templates And PowerPoint Themes 1012-Visually support your Microsoft office PPT Presentation with our above template illustrating a grey computer mouse connected to word Cloud. Letter O is replaced by a globe. This template represents the concept of networking. It makes interaction and communication more convenient. This template will be a web based platforms for computer systems. The structure of our templates allows you to effectively highlight the key issues concerning the growth of your business.-Cloud With Computer Mouse PowerPoint Templates And PowerPoint Themes 1012-This PowerPoint template can be used for presentations relating to-"Browse the global cloud, computer, internet, technology, business, global" Carry your thoughts on our Cloud With Computer Mouse PowerPoint Templates And PowerPoint Themes 1012. They will take them that much further. Fastidious conditions egg us on. Our Cloud With Computer Mouse PowerPoint Templates And PowerPoint Themes 1012 team exult in challenges.